It was about as gritty of an effort as they come for the Dover-Sherborn boys on the road at Westwood on Monday afternoon. 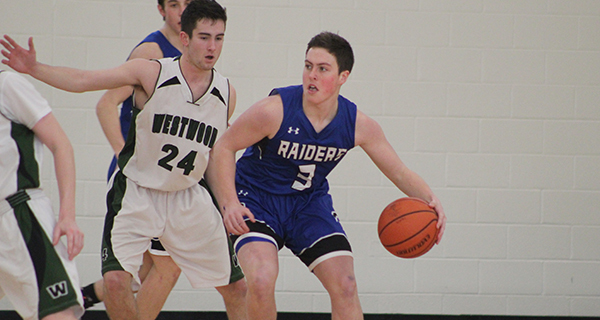 The Raiders (10-3, 6-3) came from 13 down to tie the game late, while senior captain/forward Brett Stark battled through the flu to record a game-high 19 points. 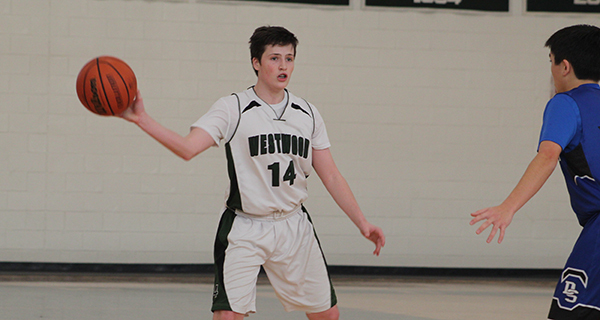 In the end, however, it still was not enough, as sophomore guard James McGowan (18 points) and junior guard Patrick Reilly (15 points) helped carry Westwood to a thrilling 67-65 victory to remain unbeaten in TVL play. Senior guard Owen Gaffney also finished in double figures for the Wolverines (11-1, 9-0) with 11 points. It took a couple minutes into the game for the two sides to find their rhythms on offense, but DS took a 6-3 lead off of back-to-back three-pointers by sophomore guard Evan Skeary (11 points) and senior forward Alex Waugh (seven points). Back-to-back three-pointers by McGowan gave Westwood back the lead at 9-6 and forced DS to a timeout. Following the break, Westwood began aggressively pressing DS in the backcourt and forced several turnovers that resulted in easy lay-ins. The Wolverines extended their lead to 20-11 at the end of one quarter. A three-point play by junior forward Favor Wariboko (seven points) extended the Westwood lead to 30-20 midway through the second quarter. The game entered halftime with Westwood ahead by nine at 34-25. The Wolverines went up by as many as 13 at 40-27 early in the third quarter before DS called another timeout to settle things down. Whatever adjustments DS made during the timeout worked perfectly; the Raiders embarked on a 9-0 run, headlined by a three-point play from Stark to trim the deficit to 40-36. A three-pointer by Kirby Ryan moments later cut the deficit to a single point for DS at 42-41, but Gaffney immediately responded with a three-pointer for Westwood to extend the lead back to 45-41. A lefty fade by junior forward James Bean (four points) just before the buzzer gave Westwood a 49-45 lead at the end of three quarters. The teams continued to trade blows throughout the fourth quarter. A pair of free throws by Waugh trimmed the deficit to 50-49 for DS, but Westwood kept answering every time DS got to within a point. A three-pointer by Reilly with 2:15 to play gave the Wolverines a five-point lead at 64-59. Back-to-back layups by Stark and Skeary made it a 64-63 game with 1:22 remaining, followed by a layup from McGowan to make it 66-63. Down 67-65 with 10 seconds to play, DS got the ball back for one final shot to tie the game. The Raiders inbounded the ball to Stark, who drove into the paint and lofted up a shot that came up just short of the rim. Westwood grabbed the rebound and the buzzer sounded as the Wolverines escaped with the two-point victory. The TVL-leading Wolverines will return to action at home on January 25 against Ashland while DS will look to get back on track at Bellingham the same night.